Well we didn't stay on standby very long. They started flying again at 1 am this morning. I don't fly till 1 pm. They say we'll probably go back on standby at noon so maybe I won't have to fly. But that means I'll be the first to go when they call us. The momma-sans are cleaning now. They swept the floor and made the beds. They're collecting our boots to polish them and marking our clothes so they don't get mixed up when they wash them. Can't beat that. 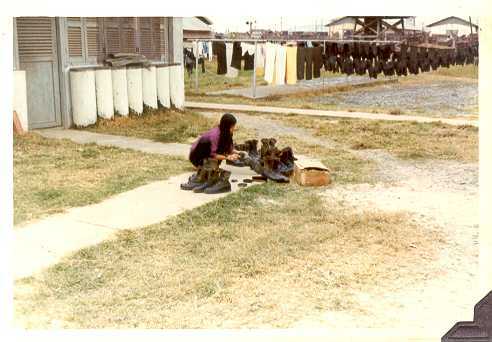 Not many places in the army you have your own house maid. The mamma-sans just said her iron isn't working. She held it up, "Number 10, GI, Number 10 GI." There is just too much of a load on the circuit. They've got one line running to the hut and everything hooks to it - the lights, the maids have a hot plate for heating water, we've got a television that belongs to one of the radio operators, a refrigerator and a couple of radios and tape players. The iron just isn't getting enough electricity. Neither is anything else for that matter. Well, so much for the problems of life in Vietnam. See you later.